Tulsi is native to India, where it often graces shrines and homes as an aromatic perennial shrub. Tulsi is grown as an annual herb in temperate climates. 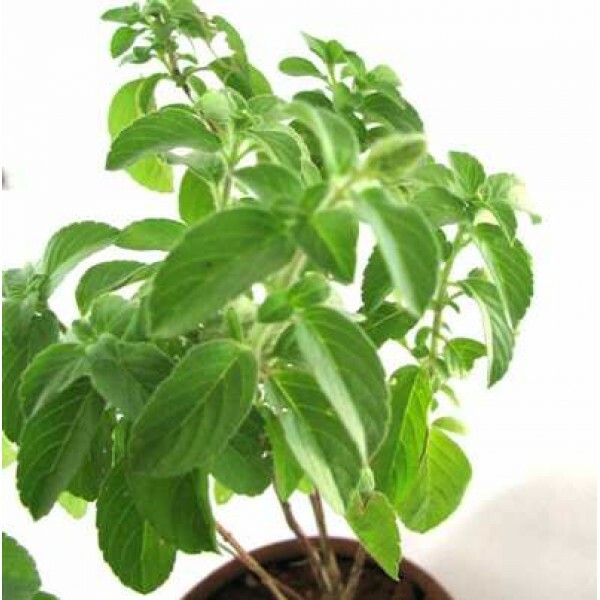 The tulsi plant is pleasing to the eye, with an upright, open and branching form. The fragrance of the leaves is also quite attractive-spicy and complex, often resembling clove. The taste is excellent, especially when the dried leaves are brewed into tea. The flowers of purple or blue occur on multiple upright racemes. Kapoor Tulsi (Ocimum sanctum) with leaves of green, and Vana Tulsi (Ocimum gratissimum), which is unmodified from its wild form. Tulsi exhibits great variation across its range and among the several domesticated cultivars. Variations in soil type and rainfall may also equate to a difference in the size and form of the plants as well as their medicinal strength and efficacy. Tulsi seed is easy to germinate and grow. Sow the small Tulsi seeds in early spring indoors or in the greenhouse for an early start, or sow Tulsi seed directly in the spring or summer garden. Sow Tulsi seeds just under the surface of the soil and press in firmly. Keep Tulsi seed watered and warm until germination, which occurs within 2 to 3 weeks (faster for Kapoor). Tulsi prefers full sun, rich soil, and plenty of water. Thin or transplant to 1 to 2 feet apart. Tulsi does well in pots or window boxes, and is traditionally grown for good luck near the front door of the house. Tulsi seed is easy to germinate and grow. Sow the small Tulsi seeds in early spring indoors or in the greenhouse for an early start, or sow Tulsi seed directly in the spring or summer garden. Sow Tulsi seeds just under the surface of the soil and press in firmly. Keep Tulsi seed watered and warm until germination, which occurs within 1 to 2 weeks. Tulsi prefers full sun, rich soil, and plenty of water. Thin or transplant to 1 to 2 feet apart. Tulsi does well in pots or window boxes, and is traditionally grown for good luck near the front door of the house.